Major universities from six African countries will next year stand a chance to develop regional hubs for agricultural learning with the help of grants worth US$20 million from the World Bank via the Regional Universities Forum for Capacity Building in Agriculture (RUFORUM). The beneficiaries will be selected by the World Bank after a call for proposals is released in September. They will be in Cameroon, Mozambique, Malawi, Ghana, Kenya and the Ivory Coast. The chosen universities will be expected to use the money to address key knowledge gaps in Africa’s agricultural sector, including dealing with climate change, building professional agri-business production and distribution chains, data management and mitigating post-harvest losses. The awards will be one of the biggest grants given to universities through RUFORUM, established by 10 African vice-chancellors in 2004, and now comprising 85 African universities from 36 countries, which is supported by the World Bank and other donors. “The idea is for the universities to model themselves as anchors for the region in order to cause transformation and have a wider impact. That is why the grant is being given to institutions rather than individual researchers,” said Dr Paul Nampala, grants manager at the Kampala-based RUFORUM secretariat. These awards build on RUFORUM’s existing funding procedures through which it has been supporting the training of scientists and innovative agricultural research programmes by giving grants to faculty members in its network. The money is often sourced from charitable foundations and governments. “The aim of the grants is to develop interventions that impact rural development, and universities, if supported, can do impactful research,” said Nampala. Studies show that for agriculture in Africa to grow rapidly and contribute to transformation and development, enhanced capacity in research and development is crucial, he noted. RUFORUM’s current grants are segmented and often range from US$4,000 given to undergraduate students to conduct focused field work (usually under the guidance of a PhD student or a professor), and up to US$350,000 given directly to projects run by senior professors. These projects usually run from anywhere between one to three years. “In order for a proposal to win, there must be evidence of working as a team. It should also demonstrate a clear engagement with communities,” said Nampala. Nampala said although universities are designed to teach, research and outreach, teaching often attracts the bulk of resources and finance because of African governments’ education investing priorities. RUFORUM grants are designed to fill such gaps. Dr Drake Mirembe, a lecturer in the College of Computing and Information Sciences at Makerere University, Uganda, says knowledge-generating institutions such as universities should not be disassociated from industries within their home countries. “Farming communities need to work with researchers who generate knowledge and institutions that generate the knowledge need to understand the farmers,” said Mirembe. Some of the biggest names in global education and technology will be attending the upcoming eLearning Africa conference – the largest in Africa on learning, training and technology – to be held in Kigali, Rwanda, later this month. Among those attending the event to be held in the Kigali Convention Centre from 26-28 September are Professor Nii Narku Quaynor, who established some of Africa’s first internet connections; Dr Martin Dougiamas, the founder of the open-source learning platform, Moodle; Elliott Masie, founder of the Masie Center and chair of the Learning Consortium; Dr Bitange Ndemo of the University of Nairobi, Kenya; and Dr Mamphela Ramphele, an academic, anti-apartheid campaigner and entrepreneur from South Africa. They will be among hundreds of experts, converging under the main conference theme of “Uniting Africa” and looking at how technology can break down barriers, enabling Africans to share knowledge, learn and prepare for the future together. According to conference organiser Rebecca Stromeyer, the fourth industrial revolution presents a big opportunity for Africa to leapfrog its competitors. “We are in a period of major change,” said Stromeyer. “Africa has the advantage of the youngest population on earth. It is full of opportunity and promise. However, in order to seize the opportunity, Africans must come together and ensure that the whole continent is fit for the future. That means sharing knowledge and experience, breaking down barriers to communication, opening up access, supporting diversity and giving all Africans a chance to learn and acquire the skills they need to succeed.” She said the upcoming edition of eLearning Africa will provide a platform to some of the best known authorities on eLearning, along with some of the EdTech industry’s most successful entrepreneurs. They’ll be joined by analysts, technologists, administrators, political decision-makers and investors. “eLearning Africa really is a place where experience meets opportunity and innovation,” she said. Kenya’s education system is facing the right kind of problem. One of the youngest and fastest growing economies in Sub-Saharan Africa, it’s experiencing a boom in demand for higher education and needs to modernize. As it stands, there aren’t enough teaching resources to cope with large numbers of young university applicants. In a way, it’s a good problem, one that stems from encouraging socio-economic development and a diversifying economy. And it seems Kenya’s educators are taking the right approach to solving it. They are embracing new methods of teaching, new ways of improving teaching standards, and new ways of tailoring courses to the needs of the economy. Video conferencing in higher education has become one of the key technologies for delivering those improvements, and it could help meet the demand for world-class education. According to an October 2017 report from the World Bank, enrollment in Sub-Saharan higher education courses is growing at a rate near double that of the world average. The region is building on a relatively low base beginning in the 1970s, so the raw numbers aren’t nearly as large as North America or Europe, but the trend is clearly positive. Educartis, an online education platform the operates across Africa, has said the spike in university demand over recent decades has been caused by globalization and a government focus on higher education as a driver of socio-economic growth. It has argued that investment in new technologies like online learning and personalized course structures is needed to meet the demand. 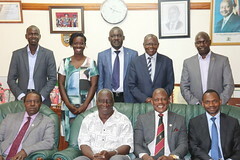 That’s a message reflected in the initiatives of Mount Kenya University, a private institution promoting the use of video conferencing and virtual classrooms. The school’s leaders have said virtual learning is the most viable method for meeting the nation’s educational and economic needs.